The towing strap is calculated to be bolted with M12 bolt. The MX5/Miata chassis offers only M10 fixing point. Bolted to the OEM towing eye points it hangs on the side and will scratch/damage the nose cone in real towing case. The mount will solve the upper issues, by safely offsetting the mounting point from the nose cone end to its middle. More important, it fixes to the towing eye structure points with two M10 grade 10.9 bolts and provides the hole for the M12 bolt, making the connection stable, as meant to be. 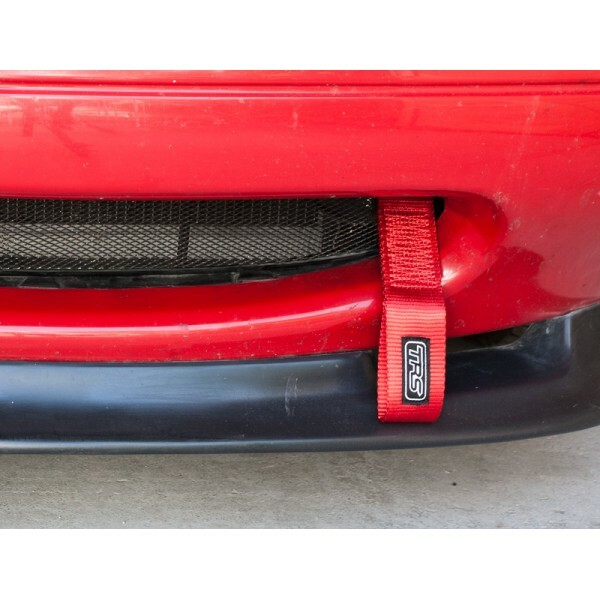 The mount are available as black, to discrete integrate in the "mouth" opening in case and in case the strap is used only for towing/racing. Please note, we don’t sell the towing strap, you will receive only the black mounting bracket. The towing strap should be ordered separately, there are different options for them available.